EUR/USD is trading below 1.1400, extending its losses in a gradual downward drift. The latest hit to the common currency came from German Factory Orders. They dropped by 1.6% in December, significantly worse than expected. The German economy is showing more and more signs of a slowdown. The central bank, the Bundesbank, said that the economy escaped a recession, but these figures may imply that the continent’s powerhouse may have contracted in Q4 2018, adding to concerns of a recession. The latest substantial data point in the US also fell below expectations. The US ISM Non-Manufacturing PMI came out at 56.7 points, slightly below projections. However, America’s services sector is still growing at a satisfactory pace according to this gauge. All in all, the USD remains the leader in the current global slowdown. US President Donald Trump delivered his belated State of the Union address to Congress and the nation. The SOTU was a wide-ranging speech in which he confirmed a second summit with North Korean leader Kim Jong-un towards the end of the month. UK companies are ramping up preparations for a no-deal Brexit as PM Theresa May prepares to meet European Commission President Jean-Claude Juncker on Thursday. She may be moving towards the European position on the Irish backstop but could lose support at home on the way. The pound suffered, and this may have a collateral adverse effect on the euro. The calendar is light once again. The US publishes the preliminary Unit Labor Costs and trade balance numbers. Both are second-tier numbers. Fed Chair Jerome Powell speaks after US markets close and may impact markets. 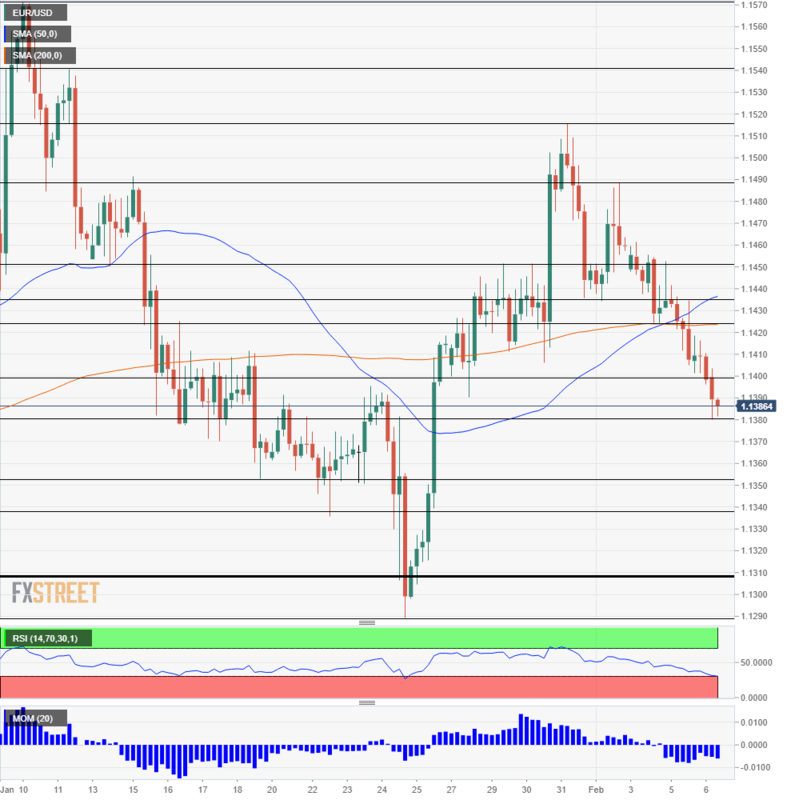 EUR/USD maintains downside momentum, but the Relative Strength Index is flirting with 30, the level that indicates oversold conditions. Will we see a bounce here? It may well be a dead-cat bounce given the fundamentals. The pair remains below the 50 and 200 Simple Moving Averages.